Sorry. The CD is out of stock. 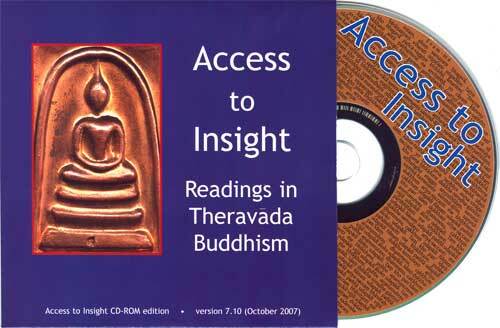 The Access to Insight CD-ROM is a free copy of the Access to Insight website that you can use without being connected to the Internet. All it requires is a computer with a CD-ROM drive and a web browser. It's very much like the offline edition of the website, with the added bonus of all of Access to Insight's PDF files. It's packaged in a simple cardboard sleeve and sealed with a small plastic "wafer seal". It makes for a nice little Dhamma gift for a friend. Sorry. I've given away all 1,000 copies. Can I order one by email? No, I do not send CDs in response to email requests. Why not? Because it is just too easy to send email (even a robot can do it). The modest effort you invest in choosing a postcard, addressing it, stamping it, and taking it to the post office implies a genuine desire for the CD. It tells me that you'll put the disc to good use. Hey, I sent you my postcard a long time ago and I haven't received anything yet. What's going on? Please keep in mind that this is a one-man operation; it will take me awhile to stuff, stamp, and mail all 1,000 envelopes. I ran out of copies. If I receive thousands of requests (as I did for earlier editions), it is impractical for me to send a note to everyone saying "Sorry, none left". You forgot to give me your address. A surprising number of people forget to do this! Either your card or my package got lost in-transit. Although the US mail system works amazingly well, once in a great while a letter does fail to reach its destination. It happens. Help! I put the CD in my stereo and I don't hear anything. What's wrong? This is a CD-ROM, not an audio CD. It only works on a computer with a web browser. Help! I'm having some other problem with the CD-ROM. Can you help me? Yes! Just contact me, and I'll do what I can to help. Why did you make a CD-ROM of the website? To make these texts available to people who lack easy access to the Internet. To provide opportunities for people to give a small gift of Dhamma. It's one thing to say to someone, "Hey, check out this URL!". It's quite another to physically place a CD containing 1,000+ suttas in their hands. To create a distributed backup system as insurance against some possible future collapse, shutdown, or censorship of the Internet. Can I download an ISO 9660 image of the disc? Yes! Feel free to download the ISO 9660 image and mount it on your computer's filesystem. It comes as a 30MB zipped file; unzipped, it's about 80MB. You are free to make copies of it, burn it onto discs and give it away free of charge. Like everything else on Access to Insight, however, you may not sell it. I offer the ISO 9660 image "as-is". I do not provide any technical support for it. You're on your own! What's the difference between the CD and the downloadable website? The CD contains the same texts that are on the downloadable website (the "bulk download") plus all the PDF files that are on the live website. For more about the differences between the various editions of the website, please see the FAQ. Were there earlier versions of the disc? The source of this work is the gift within Access to Insight "Offline Edition 2012.09.10.14", last replication 12. March 2013, generously given by John Bullitt and mentioned as: ©2007 Access to Insight. This Zugang zur Einsicht edition is 2013 (ATI 2007-2013).